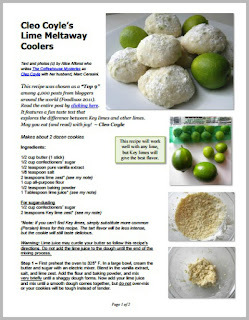 Lime Meltaway Coolers are a delectable cookie, beautiful for party trays and they freeze wonderfully, too. You can use any lime to make this cookie, but Key limes will give you the very best flavor. So what's the difference between Key limes and the larger limes that I see in my grocery store? Keep reading and you'll find out! To download this recipe now in a PDF that you can print, save, or share, click here. To continue reading this post, scroll down or click here or on the Read More link below. An earlier version of this recipe post was chosen as a "Top 9" of over 4,000 foodie posts from around the world by the editors of Foodbuzz (6/2011). Key limes are smaller, rounder, more aromatic, and have a thinner rind than our more common Persian limes. They're picked green and turn yellowish as they ripen. The name Key lime comes from the fruit’s association with the Florida Keys, but today most Key limes are cultivated in Mexico. Around the world this variety is more commonly known by other names: the West Indian lime, the Omani lime, the Mexican lime, and the Bartender’s lime. There should be in theory. The larger, Persian limes were created in 1895 by a California man named Bearss who wanted to develop a seedless lime that was milder than the Key lime, but until now I never actually sampled them back-to-back. For this blog post, I decided to give it a try. I guessed every one correctly--and not because I'm ready to take on Gordon Ramsay. I simply knew Key limes were supposed to be more acidic than Persians. I expected the Key lime juice to be more tart and intense. And it was. The difference was not subtle. The Persian lime juice (1) smelled and tasted almost sweet. I could easily sip the juice without...well, gagging. On the other hand, the freshly-squeezed Key lime juice (3) was so acidic that I had a hard time sampling it straight. Clearly, the Key limes bring a much bigger punch to any flavoring party. The bottled Key lime juice (2) was easy to identify, as well, but not for a good reason. Like most bottled juices, it tasted more sour than bright. In the past, for convenience, I have used bottled juices, but after this taste test, I’m going to try harder to use fresh-squeezed whenever possible. When you sample them back-to-back, there really is no comparison. As for the recipe I'm sharing with you today, I made batches of these cookies using each type of juice tested above, and all three worked just fine. Key limes will give you a more intense lime flavor, but Persian limes work, too. The only advice I can give you is to use fresh-squeezed juice if you can. You’ll get much better flavor that way, and you know I always want you to eat with joy. the editors of Foodbuzz.com (6/18/2011). *Note: As mentioned above, if you can’t find Key limes, simply substitute the more common (Persian) limes for this recipe. The tart flavor will be less intense, but the cookies will still taste delicious. Warning: Lime juice may curdle your butter so follow this recipe's directions. Do not add the lime juice to the dough until the end of the mixing process. Directions: First preheat your oven to 325° F. In a large bowl, cream the butter and sugar with an electric mixer. Blend in the vanilla extract, salt, and lime zest. and mix very briefly until a shaggy dough forms. about one inch in diameter. or a silicone sheet and bake for 15 to 20 minutes. The cookies are done when bottoms are slightly browned. Note that cookies are fragile while warm, so handle with care. 2 teaspoons lime zest in a shallow bowl. one at a time, in the bowl of sugar and lime zest. mixture over the cookie tops. Store cooled cookies in an airtight plastic container.